This lovely house, tucked away at the end of a Kingspoint cul-de-sac, overlooked a beautiful wooded ravine. But the view of the ravine came at a price. The steep slopes typical of the ravines in our area make it tricky to site a house properly. As we’ve seen time and time again, the house had been placed on the property in such a way that it acted as a dam, slowing and trapping water in the front yard. 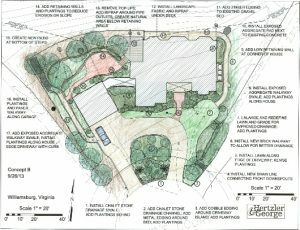 If the original site plan had been thought through a little more carefully, it wouldn’t have been too much of a problem, but the builders installed a driveway and walkway at the front of the house that were too flat to adequately drain water away, and no attempt was made to keep water from rushing down planting beds. As a result, large amounts of dirt were accumulating at the front walkway with each rainstorm. 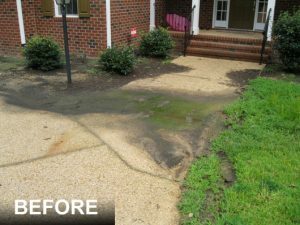 At the side of the house, a rip rap drainage channel had been installed to funnel runoff down the side of the house, but since it wasn’t correctly installed and had become overgrown with weeds, water began to drain alongside the house foundation instead, and it was eroding soil. Hertzler and George’s approach to the drainage problems on the property was to keep the rain runoff moving from the cul-de-sac to the back yard as directly and quickly as possible, and to keep it away from erodible areas like mulched planting beds. But tearing out the existing driveway and installing a new, properly sloped one was too expensive, so we had to find a way to work with what we had. H&G developed two concepts for the client, identifying all the problem areas an recommending solutions. This allowed the clients to determine their priorities, and figure out how much they wanted to spend. This concept uses turf in the center island to stabilize soil that had been eroding onto the driveway. It also features an exposed aggregate drainage channel to the east of the house and a small brick terrace off the back of the house. A chalet stone drainage swale at the top of the island diverts water off the mulch and onto the driveway. 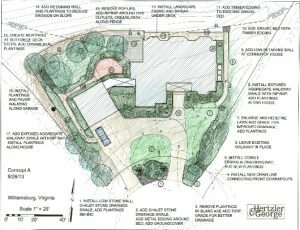 This concept keeps the existing planting in the driveway island and supplements it with groundcover to stabalize the soil. It features a curving drainage channel along the house and a larger patio and terraces in the back yard. As with most projects, the clients selected the features they liked from both options, and we combined them into a final plan for construction. 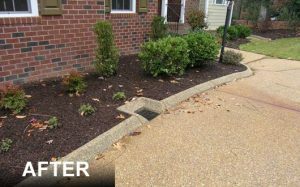 One of the main issues was water draining from the cul-de-sac through the driveway planting bed, washing soil and mulch onto the pavement. 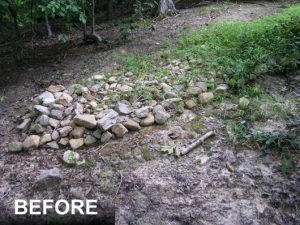 To keep runoff out of driveway planting bed, H&G installed a river rock swale in the front to divert water away from the bed and onto the driveway. 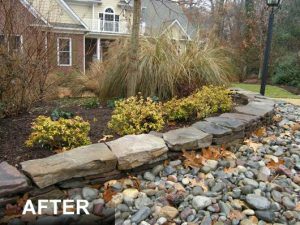 The swale is complemented by plantings, boulders and a decorative stacked stone wall to give a natural look. We also added extra plantings throughout the bed that once established, will help keep the soil and mulch in place. To keep water moving on the driveway, we also installed concrete curbs along the edges of the drive in the areas that were most susceptible to erosion. And as an extra precaution, we installed a drain in one of the flattest spots along the driveway. Finally at the side of the house H&G removed the rip rap and installed a concrete drainage channel to flush water around the house. 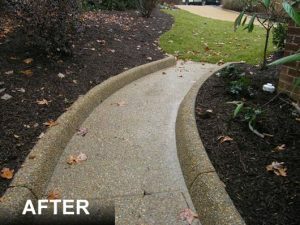 This allows the water to move quickly without the weed and maintenance problem you sometimes get with rip rap, and it also provides a pathway for easier access around the house.